Most of the southern coast of Crete in the western region of the island is characterized by a very harsh landscape. The rocky shore is often devoid of the beach, and those that are easily accessible are located in small coves. Against this background, the beach in Triopetra is extremely large and without the slightest exaggeration, you can call it a giant. The gentle gravel coast stretches over a few kilometers, the vast majority of the beach being the area where it is in vain to look for sun loungers to rent or tourists who are crowding. 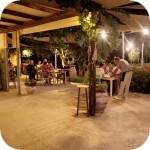 Triopetra (Τριοπετρα) is located at the foot of the Siderotas Mountain about 52 km south of Rethymno. In the old days there was a settlement here, which was a cluster of a dozen or so small houses built mainly by the residents of the village of Akoumia, located about 13 km north of Triopetra. At that time, these buildings were inhabited only during the summer. Residents of the village of Akumia moved to them to be closer to their cultivated fields. The name of this place comes from the look of a frayed peninsula located at the eastern end of the main beach. It is completed with three characteristic rocks emerging from the sea. The name "Triopetra" is just like "Three rocks". The main definitely larger and more extensive Triopetra beach is located west of the peninsula. It is sometimes called Chatzi or simply Western Triopetra. It stretches over a few kilometers of the coast, which here is covered with a mixture of gray sand and fine and coarse gravel. Descent into the water is relatively steep, and the bottom is covered with fine gravel. Just a few meters from the shore, the depth of water can reach the breast of an adult, so this place is not an ideal recreation base for people with small children. The south-west orientation of this beach makes it a great place to enjoy sunsets. The expanse of Triopetry and the lack of cover from land mean that the beach is particularly sensitive to weather conditions. Strong winds blowing from the west direction can cause a lot of waves here, which can be quite tedious. 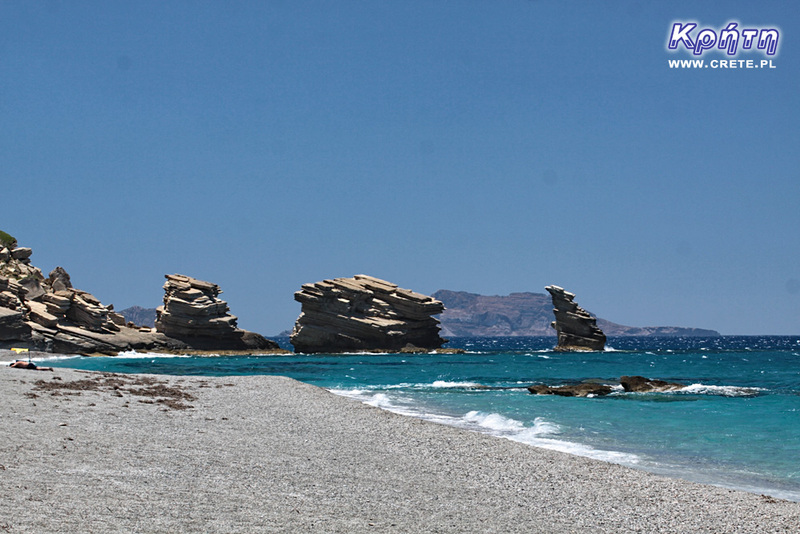 The other beach, located on the eastern side of the peninsula, is called the Little Triopetra or Koumado. It is located in a closed rocky bay. In this place a small Akoumianos river flows into the sea and a small port is located on the coast. Triopetra is definitely a place to see. If you've got tired of the hustle and bustle on the northern coast, here you will find your oasis of peace. We are captivated by this place. It is very picturesquely located, and the color of water passing from the dark grenade through the turquoise contrasting with the gray of the beach is an unusual combination of colors. There is a car park next to the beach, where you can park your car and a few taverns where you can find delicacies of the local cuisine. Triopetra is located about 60 kilometers south of Rethymno. There is a relatively convenient road leading from the northern coast area. Follow the New National Road at the height of the city of Rethymnon, take the exit for the town of Spili, Timpaki (national road number 97). The most convenient access is via the road from the town of Akoumia, which is located just before Nea Kria Vrisi and is about 30 kilometers away from Rethymnon. This road leads through very picturesque areas and has been marked on the Fraytag & Berndt map as an observation route. Elafonissi is a small island located at the end of the south-western edge of Crete. A characteristic feature of Elafonisi is the shallow lagoon connecting it with Crete. Warm and crystal clear water with a color changing from green to deep blue, is adjacent to beautiful wide beaches, whose white sand is in some places mixed with broken shells creating picturesque pink stripes. This amazing blend of colors makes Elafonissi easily claim to be called an exotic paradise.